Wing span: 3/4 - 1 1/8 inches (2 - 3 cm). 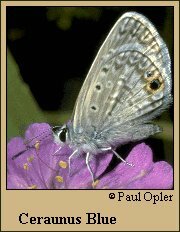 Identification: Upperside of male light blue with a darker narrow border; female dark brown, often with wing bases blue. Underside gray; both wings with a row of dark postmedian dashes. Florida butterflies have one submarginal eyespot on hindwing; Southwest butterflies have two. Life history: Males patrol during warm hours of the day for receptive females. Eggs are laid singly on flower buds or leaves of host plant; caterpillars feed on flowers and seedpods. Flight: Throughout the year in Texas and south Florida, late summer in other parts of its range. Caterpillar hosts: A variety of woody legumes including partridge pea (Cassia brachiata), mesquite (Prosopis species), and rosary pea (Abrus precatorius). Habitat: Open woodland, desert scrub, dunes, pastures, road edges, and vacant lots. Range: U. S. Southwest, South Texas, Florida and the Keys south through the West Indies, Mexico, and Central America to South America. Strays to North Carolina, Missouri, Kansas, and Nevada.